Purpose: Prostate cancer patients with surprisingly high prostate-specific antigen (PSA) are encountered clinically. However, descriptions of this group of patients are extremely rare in the published literature. This study reports treatment outcome and long-term prognosis for this group of patients. Patients and methods: Between January 2007 and December 2012, 2,064 patients with PCa diagnosed at a tertiary medical center were retrospectively reviewed. A total of 90 PCa cases were identified with initial PSA (iPSA) >1,000 ng/mL at diagnosis. A retrospective study was conducted in this cohort, with comparison among stratified patient age groups, PSA, treatment options, and overall survival. Results: The mean PSA at PCa diagnosis in this cohort was 3,323 ng/mL (1,003–23,126, median: 2,050 ng/mL). Most patients were in the age group 65–79 years (55/90, 61%). Males older than 80 years had a poor prognosis (P<0.001). Forty-six patients (51%) underwent orchiectomy with a median follow-up period of 16.2 (1.3–72.7) months, compared to 44 patients treated with medical castration and a median follow-up of 9.1 (0.3–70.5) months. Kaplan–Meier analysis revealed survival benefit from treatment with orchiectomy (P<0.001). PSA reduction >90% of iPSA following primary androgen deprivation therapy (reaching true nadir) could be a predictor of longer survival (P<0.001). Cox regression revealed the hazard ratio (HR) of variables were age (HR: 4.57, 95% confidence interval [CI]: 1.45–14.37, P=0.009), reaching true nadir (HR: 0.12, 95% CI: 0.03–0.58, P=0.008), and the treatment option with orchiectomy (HR: 0.22, 95% CI: 0.65–0.76, P=0.016). Conclusion: Age ≥80 years indicated poor overall survival in PCa patients with iPSA >1,000 ng/mL. Reaching a true nadir of PSA following primary androgen deprivation therapy could be a predictor of longer survival. Bilateral orchiectomy is recommended for this group of patients. Prostate-specific antigen (PSA) is widely used in prostate cancer (PCa) detection, treatment outcome, and prognosis. PCa screening with PSA is controversial given concerns of possible over-diagnosis, overtreatment, and no definite survival benefit especially in older men.1 Without population-wide PSA screening, a certain group of patients, especially the elderly, was diagnosed with PCa with PSA >1,000 ng/mL, compared to the well-recognized normal threshold, which is <4 ng/mL. PSA calibrates closely with disease status at its lower end, which enables PSA as a sensitive marker for early detection of PCa and a surrogate for recurrence and prognosis after radical treatment procedures such as radical prostatectomy, radiation, or minimally invasive treatment options. Extremely high PSA, however, is less defined with regard to its clinical role. In this study, we report this important missing aspect and will add to the documentation of clinically significant markers for PCa patients. All PCa patients treated, from 2007 to 2012, in Chang Gung Medical Center, Linkou were identified. All patients with initial PSA (iPSA) >1,000 ng/mL at cancer diagnosis were reviewed retrospectively in this study. PSA was measured at the central laboratory of hospital with Abbott ARCHITECT i2000. All patients were pathologically confirmed to have adenocarcinoma of the prostate. Clinical staging was determined by the seventh American Joint Committee on Cancer (AJCC) TNM staging criteria.2 The age at diagnosis, Gleason score, magnetic resonance imaging (MRI), bone scan, and clinical staging were recorded. The iPSA, Gleason score, clinical staging at diagnosis, treatment options, PSA nadir, and follow-up periods were recorded. Serum PSA was recorded and monitored regularly during treatment and follow-up. The time to PSA nadir and all events including skeletal-related events (SREs), myocardial infarction, stroke, and overall survival were recorded during the follow-up period for up to 6 years. Ethical approval from the Institutional Review Board (IRB) of Chang Gung Medical Foundation, Taiwan, was obtained. Patient consent was waived by the IRB for the retrospective chart review. Patient data was anonymized and no identifiable patient data were disclosed. 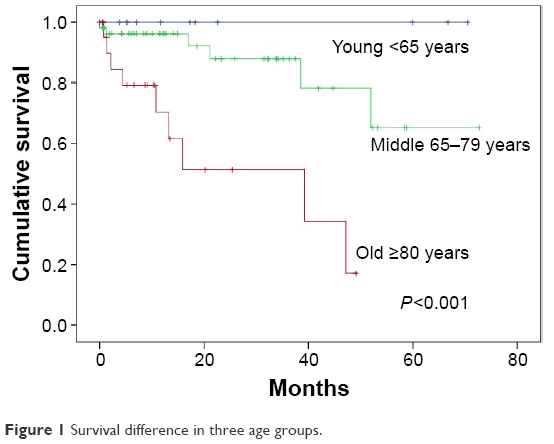 Patient age at diagnosis was stratified as young (<65 years), middle (age 65–79 years), and old (≥80 years) for survival comparison. In treatment options, chemical castration with luteinizing hormone-releasing hormone (LHRH) agonist or surgical castration with bilateral orchiectomy was recorded. Patients undergoing prompt orchiectomy within 6 months after diagnosis were identified and compared to patients who were treated with medical castration or orchiectomy 6 months or longer after diagnosis. The decisions of orchiectomy were made after full discussion between treating physicians and patients. As for the significance of the iPSA, questions arise as to whether the hazard increases proportionally with iPSA. 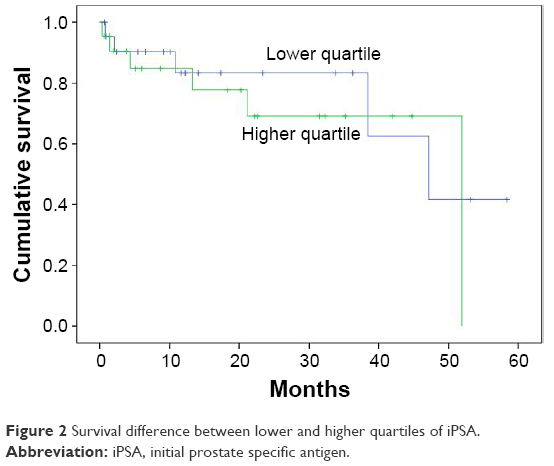 To test survival difference, patients in the lower iPSA quartile were compared with those in the higher iPSA quartile. In hormone-responsive tumors, regardless of PSA cutoff value of 4 ng/mL, we assumed a >90% PSA reduction in the nadir value to be the true nadir (TN). We compared whether patients reached TN. Data were analyzed with SPSS version 22. Categorical variables were tested with the chi-square test. Differences in clinical parameters were analyzed using nonparametric Mann–Whitney U-test. The overall survival was estimated by the Kaplan–Meier analysis. Association between variables and overall survival were analyzed with Cox proportional-hazards regression. Statistical significance was considered at P<0.05 for all analyses. In total, 2,064 patients were newly diagnosed with PCa between 2007 and 2012 in Chang Gung Memorial Hospital. 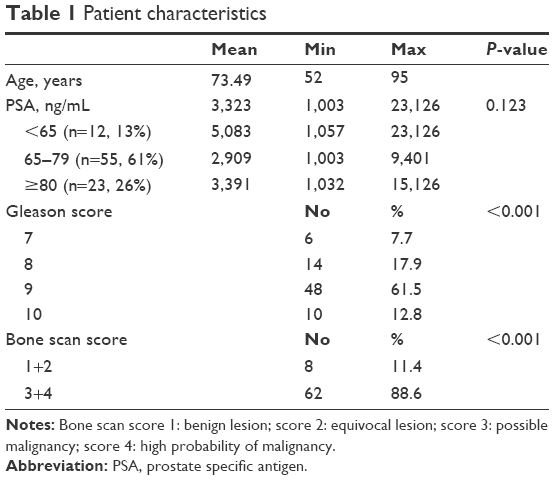 Of these, 90 patients were found to have PSA >1,000 (range 1,003–23,126, mean 3,323) ng/mL at initial PCa diagnosis. Median age at this diagnosis was 74 (range 52–95) years. Mean follow-up period was 19.1 (0.3–72.7) months. The Gleason scores (GS) were ≥7 in all patients, of which 92.3% had GS of 8–10. Clinical staging with MRI or CT revealed all tumors were stage IV. Of the 70 patients for whom bone scan study was available, 62 patients (88.6%) were rated a score 3 or 4, indicative of bone metastasis (P<0.001; Table 1). The overall incidence of SRE, acute myocardial infarction, or stroke was rare (2/88; Table 2). Notes: Bone scan score 1: benign lesion; score 2: equivocal lesion; score 3: possible malignancy; score 4: high probability of malignancy. Abbreviation: PSA, prostate specific antigen. Notes: *Denotes prompt orchiectomy in <6 months following PCa diagnosis. **Denotes medical castration or delayed orchiectomy, ≥6 months after PCa diagnosis. Abbreviations: iPSA, initial prostate specific antigen; mths, months; SRE, skeletal-related events. The majority of patients in this study cohort were 65 to 79 years old (55/90, 61%). Although the old-age group (≥80 years, n=23, 26%) and the young age group (<65 years, n=12, 13%) had fewer numbers as compared to the middle age group (age 65–79, n=55, 61%), the difference in incidence was not statistically significant (P=0.123; Table 1). In the young age group, all 12 patients survived throughout the follow-up periods. Kaplan–Meier analysis revealed significant difference in survival (P<0.001; Figure 1). Figure 1 Survival difference in three age groups. The lower quartile of iPSA had a mean of 1,126.9 ng/mL (N=22, range 1,003–1,311 ng/mL), as compared to the mean of 7,743.4 ng/mL (N=22, range 4,169–23,126 ng/mL) in the higher quartile iPSA group. Kaplan–Meier analysis revealed no significant difference in survival (P=0.568; Figure 2). Figure 2 Survival difference between lower and higher quartiles of iPSA. Abbreviation: iPSA, initial prostate specific antigen. As treatment options at this group of patients were relatively limited, androgen deprivation might have been the only choice at this stage. Treatment options included surgical excision of bilateral testes or regular LHRH agonist injection every 4 weeks or every 12 weeks according to standard pharmaceutical preparation. Oral antiandrogen was routinely administered for complete androgen deprivation. The decision of orchiectomy or regular LHRH agonist injection was the choice of patients after thorough discussion with physicians. In this study cohort, 46 patients (51.1%) underwent orchiectomy within 6 months after diagnosis, and 44 patients were treated with medical castration. 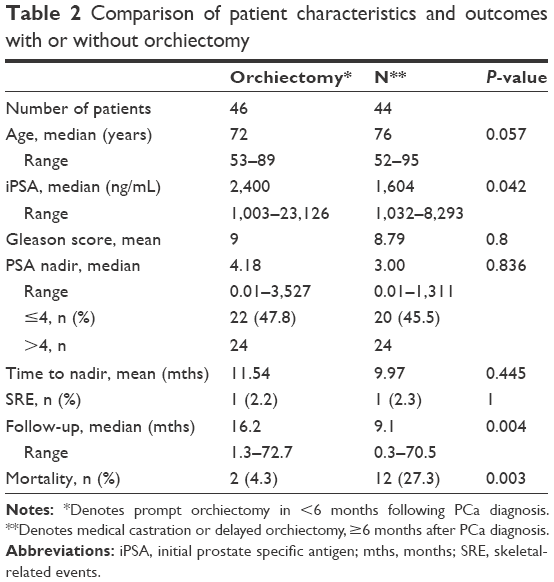 Chi-square analysis revealed that patients with higher iPSA were likely to undergo orchiectomy (P=0.041; Figure 3). The median follow-up period in the orchiectomy group was 16.2 months (1.3–72.7), in contrast to 9.1 months (0.3–70.5) in those without orchiectomy within 6 months of diagnosis (P=0.004; Table 2). Kaplan–Meier analysis revealed survival benefit in the group who underwent orchiectomy (P<0.001; Figure 4). 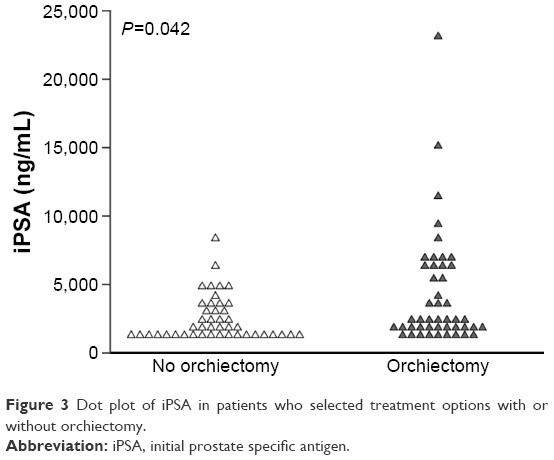 Figure 3 Dot plot of iPSA in patients who selected treatment options with or without orchiectomy. 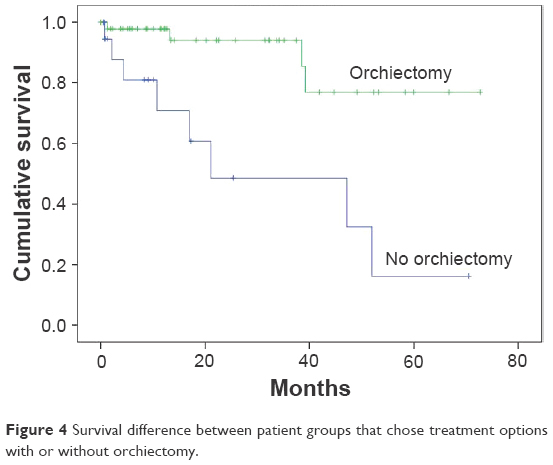 Figure 4 Survival difference between patient groups that chose treatment options with or without orchiectomy. We assumed that, if the PSA decreased by >90% after androgen deprivation, disease regression would be anticipated and patient prognosis would be better. In this scenario, the PSA nadir would be considered as a TN value. A reduction of >90% iPSA suggested hormone sensitivity, and the Kaplan–Meier analysis revealed a significant difference in survival as compared to the group that never reached TN PSA value (P<0.001; Figure 5). Figure 5 Survival difference between patient groups who did or did not reach TN following primary androgen deprivation therapy. (denoting nadir PSA value that over 90% of iPSA reduction after primary androgen deprivation therapy). Abbreviations: iPSA, initial prostate specific antigen; TN, true nadir. Cox proportional hazards regression analysis revealed that variables with hazard ratios (HR) were age [HR: 4.57, 95% confidence interval (CI): 1.45–14.37, P=0.009), reaching TN (HR: 0.12, 95% CI: 0.03–0.58, P=0.008), and treatment option with orchiectomy (HR: 0.22, 95% CI: 0.65–0.76, P=0.016; Table 3). For patients that could reach TN PSA, the treatment option with prompt orchiectomy still offered survival benefits over the patient group that chose the LHRH agonist injection (P=0.002; Figure 6). 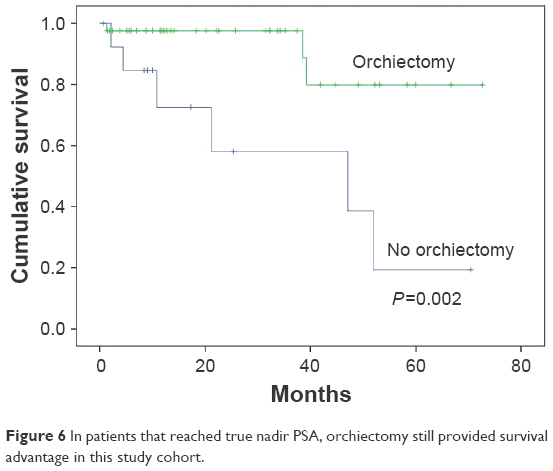 Figure 6 In patients that reached true nadir PSA, orchiectomy still provided survival advantage in this study cohort. PSA, also known as human kallikrein 3 (hKLK3), is a member of the kallikrein gene family. It was first identified in the late 1970s and subsequently confirmed for clinical use about a decade later.3,4 After its widespread clinical application in early cancer detection, PCa prevalence was found to have increased dramatically worldwide, which was recognized as the post-PSA era. PSA screening in older men is controversial.5 PCa may be asymptomatic. Symptomatic patients may consider it to be related to benign prostatic hypertrophy or aging. Delay in detection of disease is, therefore, frequently seen. An intriguing difference of PCa between Asian and Western populations is that the Asian population is more likely to be diagnosed with PCa in a relatively advanced stage, although Asian men have a lower incidence of PCa.6 In our cohort, the median age was 74 years. It is suggested that, without routine screening, elderly men may be more likely to neglect their urological symptoms and, thus, allow development of surprisingly high PSA levels. As a prostate-specific – instead of a cancer-specific – biomarker, PSA elevation could be induced by infection, prostate massage, urine retention, and other benign lesions as well as PCa. However, such discrepancy is generally seen at a PSA level <50 ng/mL. Current guidelines define a high-risk group of PCa by the PSA level, only setting a limit >20 ng/mL.7 PSA levels beyond 120 ng/mL were not readable in the past and were generally recognized as indicative of advanced PCa. With advances in technology, extremely high PSA values can be calibrated nowadays. PSA testing could span ~106 folds, ranging from 0.01 to ~104 ng/mL. In this study, the highest PSA detected was 23,162 ng/mL. The clinical significance of extremely high PSA has not been well defined. Extremely high PSA at the time of diagnosis implies tumor burden and prolonged incubation of cancer asymptomatically or with symptoms long ignored, especially in elderly men. Mahal et al reported low PSA level with GS 8–10 as a sign of very poorly differentiated tumor posing a high risk for cancer-specific death.8 In the PSA era, PSA values could be obtained very easily through blood sampling. Patients who were diagnosed with PCa at such high PSA levels could fall into two categories – those who have no marked symptom and those who ignored symptoms until they became intolerable. For those with intolerable disease, the fulminant status could be too late for androgen deprivation to be effective and the PSA TN would never be reached. In our study, patients with markedly high diagnostic PSA that could be tolerated or even asymptomatic might explain possible long-term survival of patients who tend to live with PCa as an indolent chronic disease. PCa is recognized as a disease of the elderly. The overall survival of the young age (<65 years) group was optimal, and that of the older group (≥80 years) was the worst. Age at diagnosis in relation to survival of cancer patients is an intriguing issue. Cancer-specific survival, instead of overall survival, would be theoretically devoid of a possible confounding concern of old age itself. Because of comorbidities, elderly patients often need complex evaluation to identify any treatment-related morbidity and mortality. Indeed, androgen deprivation in PCa is a weakening treatment for men that may cause osteoporosis, fractures, and cardiovascular consequences secondary to thromboembolism. All of the insidious changes, presented with seemingly unrelated events such as falls or traffic accidents, may compromise patient survival. The boundary of these two survival estimators becomes blurred. In this sense, the overall survival may be a realistic estimator. In breast cancer, Brandt et al reported that age ≥80 years was a prognostic factor for poor survival, independent of stage at diagnosis and diagnostic period.9 In PCa, Bechis et al reported that age did not independently predict cancer-specific survival.10 In our study cohort, age at diagnosis could be an estimator of overall survival in patients. This study included PCa patients with initial PSA at diagnosis >1,000 ng/mL. It was an arbitrary cutoff value only to highlight the clinical characteristic of patients with surprisingly high initial PSA at diagnosis. One may have questioned differences if the cutoff value was set at 500 ng/mL. But, that was beyond the scope of this study; however, some clues might be provided from our comparison between lower and higher PSA quartiles which revealed no statistical difference in survival (Figure 2). Bilateral orchiectomy is a cost-effective procedure that reduces testosterone to castration levels within 12 h.12 Oefelein et al found that surgically castrated men had a median testosterone value of 0.5 nmol/L or 15 ng/dL.16 The use of LHRH agonists (with antiandrogens) induces similar but delayed effects, as a result of the slower decline in testosterone levels seen with these agents compared with surgical castration.17,18 Morote et al found the failure rate to maintain androgen suppression by LHRH agonists to be 12.5%.19 This escape phenomenon may cause an elevation of serum testosterone above castration levels, potentially leading to unsatisfactory tumor control.20,21 Another possible consideration is patient compliance with the regimen of LHRH agonist injections, which may cause inadequate testicular suppression, and thereby magnifying the benefit of orchiectomy. The comparison in this study, however, was not randomized. The decision of orchiectomy or medical castration relied on patient willingness. This could be a factor of bias in this study. The PSA nadir has been proposed as an early survival predictor for PCa following androgen deprivation.22,23 Most authors examined nadir value of PSA <0.2 ng/mL. In our study cohort, we found that PSA reduction to TN could be a surrogate of tumor hormone sensitivity to primary androgen deprivation therapy and a relative stable condition for future follow-up. Despite waiving this factor when comparing patients that reached TN, orchiectomy still provided survival benefit (P=0.002), which confirmed the importance of stable hormone deprivation with surgical castration in this study cohort. Recent studies have recommended early chemotherapy in combination with androgen deprivation in selected hormone-naive PCa patients who have extensive metastatic disease. In patients with high-volume disease, combination therapies have increased not only overall survival but also higher rates of neutropenia, febrile neutropenia, and fatigue.24,25 The combination treatment strategy in this group of patients, if applicable, should be tailored according to the patient’s condition and willingness to undergo treatment. To our knowledge, this is the largest patient series of diagnostic PSA >1,000 ng/mL, reporting long-term outcomes and treatment options of survival benefits. In this cohort, patients <65 years had the best prognosis with androgen deprivation therapy, whereas patients >80 years experienced poorer outcome. 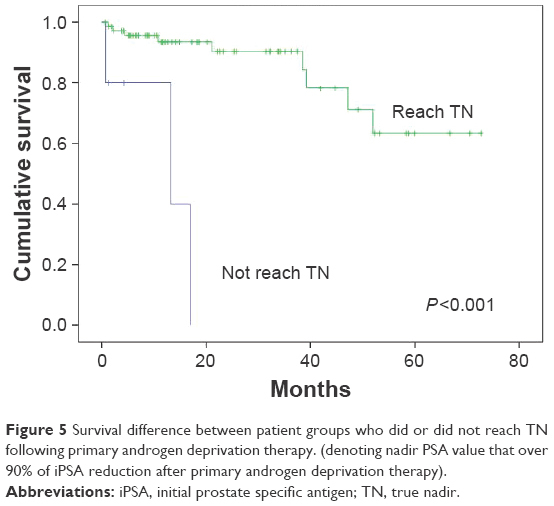 PSA reduction to >90% of iPSA following primary androgen deprivation therapy could be a predictor of longer survival. Bilateral orchiectomy providing stable castration status is recommended for this finite group of patients. The authors acknowledge the assistance from the Statistical Center for Clinical Research in Chang Gung Memorial Hospital, Linkou. Ilic D, Neuberger MM, Djulbegovic M, Dahm P. Screening for prostate cancer. Cochrane Database Syst Rev. 2013;1:CD004720. Edge SB, Byrd DR, Compton CC, Fritz AG, Greene FL, Trotti A. American Joint Committee on Cancer Staging Manual. 7th ed. New York: Springer; 2010. Wang MC, Valenzuela LA, Murphy GP, Chu TM. Purification of a human prostate specific antigen. Invest Urol. 1979;17(2):159–163. Stamey TA, Yang N, Hay AR, McNeal JE, Freiha FS, Redwine E. Prostate-specific antigen as a serum marker for adenocarcinoma of the prostate. N Engl J Med. 1987;317(15):909–916. Walter LC, Bertenthal D, Lindquist K, Konety BR. PSA screening among elderly men with limited life expectancies. JAMA. 2006;296(19):2336–2342. Ito K. Prostate cancer in Asian men. Nat Rev Urol. 2014;11(4):197–212. NCCN guideline PCa. National Comprehensive Cancer Network “NCCN Clinical Practice Guidelines in Oncology (NCCN Guidelines) Prostate Cancer Version 2.2014” Fort Washington, PA (2013). 2014. Mahal BA, Aizer AA, Efstathiou JA, Nguyen PL. Association of very low prostate-specific antigen levels with increased cancer-specific death in men with high-grade prostate cancer. Cancer. 2016;122(1):78–83. Brandt J, Garne JP, Tengrup I, Manjer J. Age at diagnosis in relation to survival following breast cancer: a cohort study. World J Surg Oncol. 2015;13(1):33. Bechis SK, Carroll PR, Cooperberg MR. Impact of age at diagnosis on prostate cancer treatment and survival. J Clin Oncol. 2011;29(2):235–241. Huggins C, Hodges CV. Studies on prostatic cancer: I. The effect of castration, of estrogen and of androgen injection on serum phosphatases in metastatic carcinoma of the prostate. 1941. J Urol. 2002;168(1):9–12. Kaisary AV, Tyrrell CJ, Peeling WB, Griffiths K. Comparison of LHRH analogue (Zoladex) with orchiectomy in patients with metastatic prostatic carcinoma. Br J Urol. 1991;67(5):502–508. Vogelzang NJ, Chodak GW, Soloway MS, et al. Goserelin versus orchiectomy in the treatment of advanced prostate cancer: final results of a randomized trial. Zoladex Prostate Study Group. Urology. 1995;46(2):220–226. Sun M, Choueiri TK, Hamnvik OP, et al. Comparison of gonadotropin-releasing hormone agonists and orchiectomy: effects of androgen-deprivation therapy. JAMA Oncol. 2016;2(4):500–507. Oefelein MG, Feng A, Scolieri MJ, Ricchiutti D, Resnick MI. Reassessment of the definition of castrate levels of testosterone: implications for clinical decision making. Urology. 2000;56(6):1021–1024. Mercader M, Sengupta S, Bodner BK, et al. Early effects of pharmacological androgen deprivation in human prostate cancer. BJU Int. 2007;99(1):60–67. Montironi R, Magi-Galluzzi C, Muzzonigro G, Prete E, Polito M, Fabris G. Effects of combination endocrine treatment on normal prostate, prostatic intraepithelial neoplasia, and prostatic adenocarcinoma. J Clin Pathol. 1994;47(10):906–913. Morote J, Esquena S, Abascal JM, et al. Failure to maintain a suppressed level of serum testosterone during long-acting depot luteinizing hormone-releasing hormone agonist therapy in patients with advanced prostate cancer. Urol Int. 2006;77(2):135–138. Morote J, Orsola A, Planas J, et al. Redefining clinically significant castration levels in patients with prostate cancer receiving continuous androgen deprivation therapy. J Urol. 2007;178(4 Pt 1):1290–1295. Oefelein MG, Cornum R. Failure to achieve castrate levels of testosterone during luteinizing hormone releasing hormone agonist therapy: the case for monitoring serum testosterone and a treatment decision algorithm. J Urol. 2000;164(3 Pt 1):726–729. Sasaki T, Onishi T, Hoshina A. Nadir PSA level and time to PSA nadir following primary androgen deprivation therapy are the early survival predictors for prostate cancer patients with bone metastasis. Prostate Cancer Prostatic Dis. 2011;14(3):248–252. Tomioka A, Tanaka N, Yoshikawa M, et al. Nadir PSA level and time to nadir PSA are prognostic factors in patients with metastatic prostate cancer. BMC Urol. 2014;14(1):33. Ceresoli GL, De Vincenzo F, Sauta MG, Bonomi M, Zucali PA. Role of chemotherapy in combination with hormonal therapy in first-line treatment of metastatic hormone-sensitive prostate cancer. Q J Nucl Med Mol Imaging. 2015;59(4):374–380. Miller RE, Sweeney CJ. Chemotherapy for metastatic castrate-sensitive prostate cancer. Prostate Cancer and Prostatic Dis. 2016;19(2):139–144.